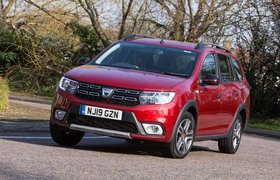 Dacia Logan MCV from less than 7000 | What Car? 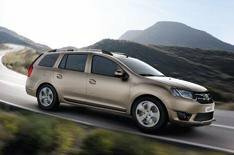 The Dacia Logan MCV is the UK's cheapest new estate car, with prices from just 6995. Based on the same platform as the Dacia Sandero, the Logan MCV uses the same engines and gearboxes as the budget supermini. Styling-wise, the Logan MCV and Sandero are the same from the driver's door forward. The Logan MCV has a 573-litre boot with the seats up, but this expands to 1518 litres with the seats folded. Three engines are available: two petrols and a diesel. The entry-level engine is a 74bhp 1.2-litre petrol that does average economy of 48.7mpg and emits 135g/km of CO2. The 89bhp 0.9-litre petrol has average economy of 56.5mpg and emits 116g/km of CO2. The 0.9-litre unit is available with Ambiance and Laureate trims. Diesel buyers get a 89bhp 1.5-litre motor with average economy of 74.3mpg and CO2 emissions of 99g/km. This engine is not available in Access trim. Trims match those of the Dacia Sandero. Entry-level Access trim is fairly basic; including body-coloured bumpers, 15-inch steel wheels, 60/40 split folding rear seats and traction control. It doesn't get a radio, but is pre-wired should the buyer wish to fit one. Ambiance trim costs 600 more than Access and includes a stereo system, Bluetooth, remote central locking, electric front windows, black roof bars and chrome details on the dashboard. Range-topping Laureate trim comes with air-conditioning, electric mirrors, cruise control, electric windows all round, a chrome grille, front foglights and a height-adjustable driver's seat. Two options packs are available. The Protection Pack costs 225 and comes with a boot liner, rear parking sensors and rear mats. Touring Pack costs 280 and features a front centre armrest, luggage net for the boot and transversal roof bars. All Logan MCVs have a three-year/60,000-mile warranty and roadside assistance. The warranty can be extended to five years and 60,000 miles for an extra 395. A seven-year/100,000-mile warranty is available for 850. Prices for the Logan MCV are 1000 more than the equivalent Sandero, and start at 6995 for the 1.2 16v 75 in Access trim rising to 10,795 for 1.5 dCi 90 in Laureate trim. Order books are open now and the car will arrive in showrooms from July.